This RIDGID 10 Gal. stainless steel wet dry vacuum is designed to deliver high performance through its 6.0 peak HP motor that easily handles tough clean-up tasks. Add a top handle with a cord wrap, stainless steel drum construction and caster feet with accessory storage and you have a shop vacuum that meets the demands of Pros, DIYers and homeowners. It features the Patented Qwik Lock Filter Fastening System that makes installing or removing your filter quick, easy and secure. 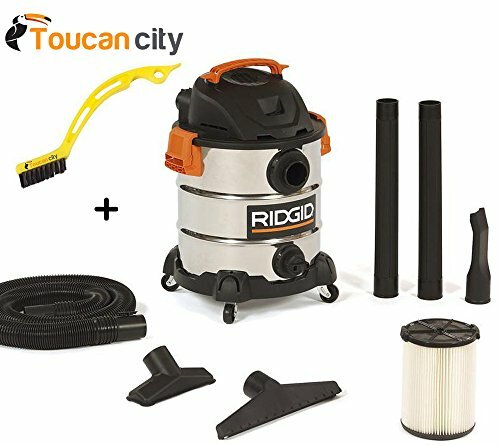 If you have any questions about this product by Ridgid + Toucan City, contact us by completing and submitting the form below. If you are looking for a specif part number, please include it with your message.